You cannot trust the color accuracy of images displayed on a computer screen. 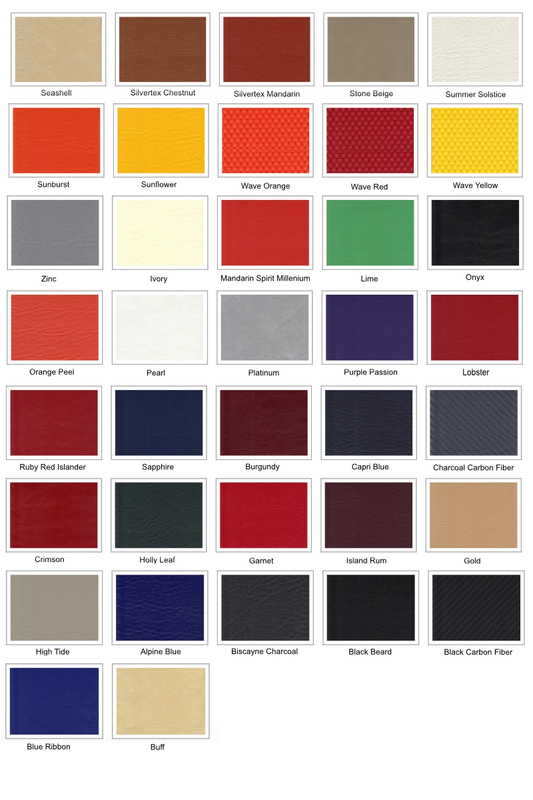 If color matching is important to you, please order a free sample below, before you order your seats. Free samples can be ordered directly from the vinyl manufacturer by clicking on the links below. Most premium vinyls have a $50 upcharge per usage. This means if you select a premium vinyl for the bolsters, and a premium vinyl for the inserts, (even if it is the same vinyl) that is an upcharge of $100. ----Check out the "TREX MET HQ" collection! ----All Enduratex product samples are complimentary. ----Any totals shown for samples are just a formality. ----You will not be charged anything for the samples. ----Check out the "Jetstream" collection for highly reflective. ----Check out the "Rush" collection! ----Look to the "Atlantis" and "Windstar" collections. ----Look to the "Phoenix" collection for emu / ostrich. ----Look to the "Canyon" collection for imitation leather. ----Look to the "Bronte" collection for snakeskin. ----Look to the "Bondi" collection for emu / ostrich. ----Look to the "Esprit" collection for variety of unique colors. ----Lots of good stuff here. ----Imitation Crocodile skin in various colors.